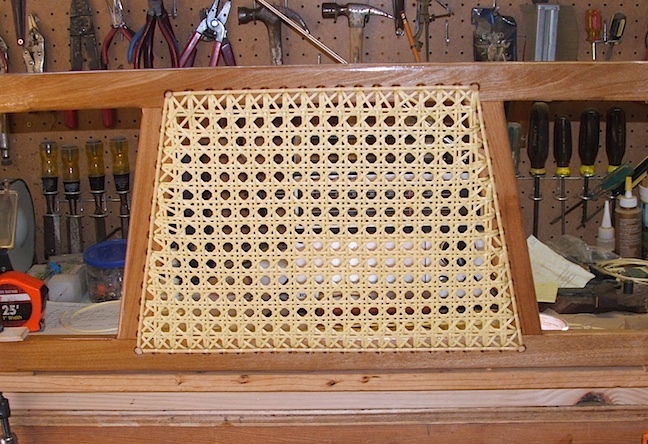 The seats for Sunshine are built from a piece of 3/4" oak and will be caned with medium plastic cane. The plastic cane looks much like natural cane but it is not effected by water. 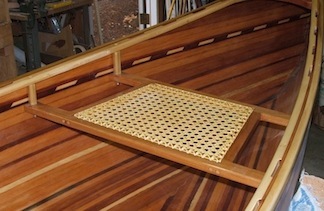 Here is the stern seat frame. 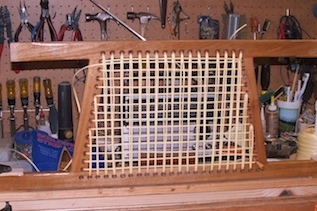 The seat rails are cut to the angles that will give me the shape to fit the lines of the canoe. 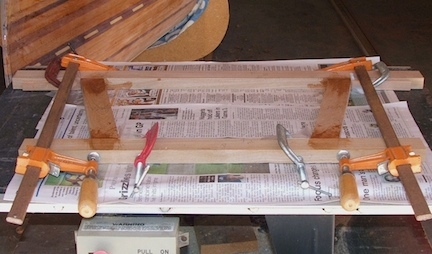 After the epoxy glue is cured I'll drill and set dowels through the wood joints for more strength. The added cane also provides more strength as it pulls the seat together quite tightly. The 1/4" holes are drilled around the perimeter for the caning. They are 3/4" on center and 1/2" from the inner edge of the seat frame. 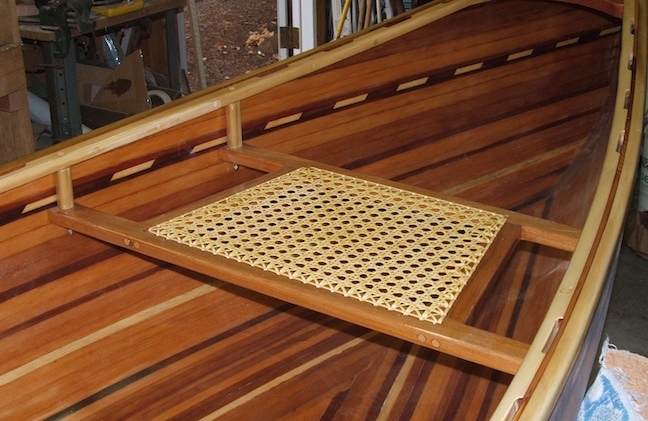 The seat frame has had three coats of Minwax "Helmsman" Spar Urethane which gives it a hard finish and a nice shine. I have clamped it to my work bench and I'm ready to start caning. The pictures above show the progressive stages of caning the canoe seats. In the upper row the picture on the left is in the beginning stage. 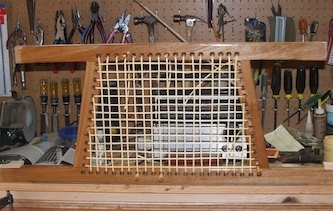 With one set of vertical and horizontal canes pulled into place. 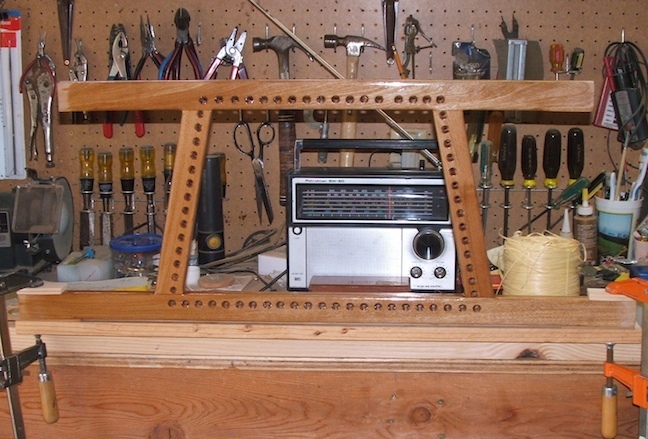 This is the base on which the rest of the seat will be built. 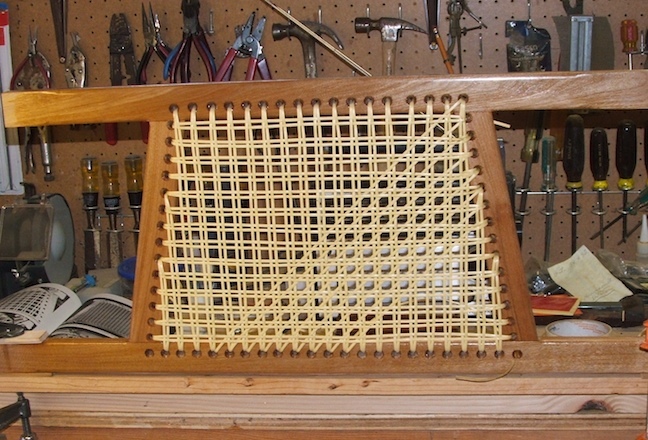 These pictures show a completed seat with all the diagonal canes in place and the binding around the edges. Small pegs are driven in at the corners and sealed with a dab of varnish. 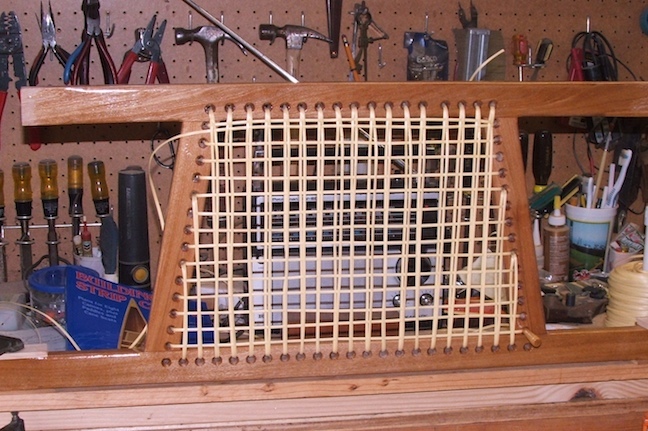 At center are the seat hangers which are made from cut-offs of the gunwale strips. A hole is drilled through and the bolts (dowels temporarily) will hold the seats in place. 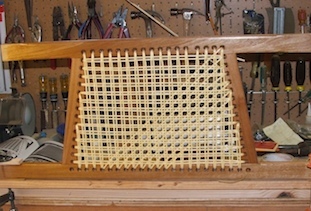 The picture on the right shows the seat installed. The bolt heads are counter-bored into the outwales with the holes plugged. The bolts under the seats have a nyloc nut and a acorn nut to prevent any sharp edges. 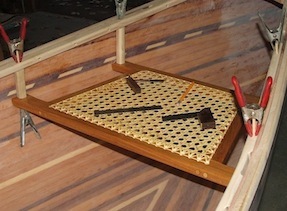 The inside surface of the canoe has received three coats of satin spar varnish.